Gela was one of the first Greek settlements in Sicily, founded - according to tradition handed down from the historian Tucidide, by the Greeks from Rhodes of Antifemo and the Cretans of Eutimo during 689 BC. On their arrival, however, the Greek colonies found stable settlements which were developed by the Sicilians, who were present on the territory from the Bronze Age; testified by the finds of ruins of Necropolis from Piano Notaro and Molino a Ventro. The colony name, in fact, derives from the same one that the Sicilians called the river which flows into the sea. The development was immediate, so much so, that the same colonies quickly founded other cities, for example Akragas (Agrigento) during 580 BC. Cleandro died leaving his place to his brother Ippocrate in 492 BC, who quickly raged war against and conquered Syracuse. He then died in battle (486) against the Sicilians, leaving his place to Gelone, head of Ippocrate’s Cavalry. On Gelone’s death, the governing of Gela passed to his brother Gerone I. In 480 BC, Gela participated in its first clash on Sicilian ground between the Carthaginians and the Greeks, namely the Battle of Imera. In 456 BC, Eschilo (Aeschylus) died, seemingly during a theatrical performance. In 424 BC, in the City, a congress of Greeks in Sicily was held which gave it its independence from the motherland colonies. In 405 BC, another clash between the Carthaginians and the Greeks, lead to a siege, and the overpowering of Agrigento and the destruction of Gela. 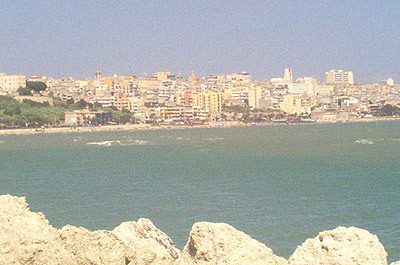 The City remain Carthaginian until the arrival of Timoleonte, who took it back under Greek influence and once again raised its defensive walls (338 BC). The Carthaginians, having lost to Timoleonte, returned threateningly under Agatocle and in 311 BC, defeated the Greeks in the second battle in Imero, therefore once more destroying Gela. On the death of Agatocle (289BC), his mercenaries, called Mamertini meaning sons of Marte (Mars), conquered Messina and devastated Gela (282 BC). The inhabitants then asked help from Finzia, a tyrant from Agrigento, who received them at Licata. Mamertini power lasted 20 years until they were beaten in battle by Lerone, from Syracuse. That battle led to the first clash between Rome and Carthage, who were both called to help the Mamertini. The Arabs, on their arrival in Gela, found only the remains of the ancient past and named it, the City of the Colonies. It was only when Federico II decided to live there, that Gela was renamed Terranova (New Land), allowing it to see a new period of economic and architectonic development. During this time a defensive wall was erected and the Castelluccio, a religious public building. Visitors can still see the remains of the Acropolis in Gela, where the can admire two gilded temples from the 6th and 5th Centuries BC and part of the wall which was erected during the 5th Century to aid in defence of the City. The Capo Soprano digs are also interesting, where one can admire the Greek fortifications which are well preserved because they were protected by 12 metres of sand per century, and the defensive walls erected by Timoleonte.